Winner from the qualification for the german horse championship by the 6 years old dressage horse and now winner and high placed in PSG ! 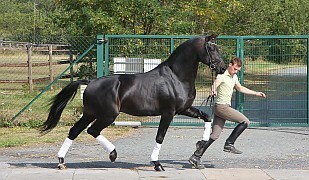 Dark bay stallion with exceptional rideability and breath-taking movements. 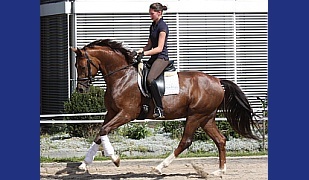 Uncomplicated, gorgeous stallion for the great dressage arena ! Amazing potential for the upcoming championship tour or the big dressage arena! Outstanding quality for the professional and wonderful rideability for the amateur! In 2018 he was 18 times high placed or winner in PSG and Intermediare I. Also on his first competition show weekend in 2019 he was in S* on the 2nd and 3rd place with near 70% and St.Gorge Special also high placed. He is also a perfect school master for young rider because he makes a good job on the competition show also some days. 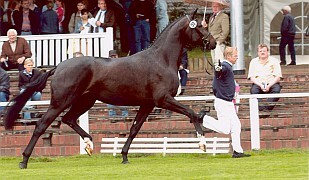 His sire, Dr. Jackson, was 11 years in the top 1 % of the German breeding list. 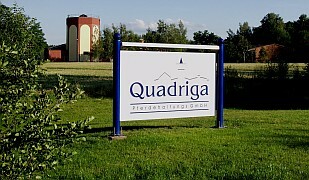 He has gained a reputation for producing top contenders for the international dressage scene (for example, the Grand Prix gelding, Douglas) and is known for passing on his excellent rideability to his offspring. His grandsire, Jazzman, further enhances this remarkable dressage pedigree. This impressive, dark bay stallion is in the top 35 % of the German breeding list and was a lot of years one of the breeding index highest sons of the Dutch top sire, Jazz. But his dam line is equally as impressive! It is the famous Waldhexe dam line which is undeniably one of the best in Oldenburg. His brothers and sisters were premium foals. Some of his sisters are premium/elite mares. 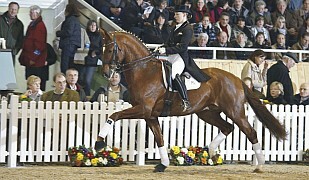 A brother sold to Spain for a high price at the Elite Auction and scored high in the Spanish Stallion Championship. A full sister was winner foal for the qualification to the German Foal Championship and also qualified for the Elite Auction. His dam is an elite mare and was already nominated for the Oldenburger elite mare show. His granddam and great-granddam are also elite mares. His granddam is the great mare Cosmopolitan, who is a stallion mother, winner of the championship in Oldenburg and placed high as a finalist in the German Horse Championship. She is the mother of our licensed stallion, Don Cismo, which won the qualification for the German Horse Championship with the dream result of 9.0 and now he is successful in Grand Prix ! She is also the dam to the Grand Prix mare Diamantina, who is an elite mare and one of the best Grand Prix horses in Australia with Maree Tomkinson. 2014 nominated for the World rider games in France and 2016 on the long list for the Olympic Games in Rio. 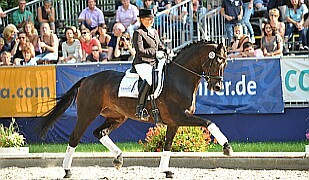 Other sister also qualificated for the german horse championship by the 5 years old dressage horses.